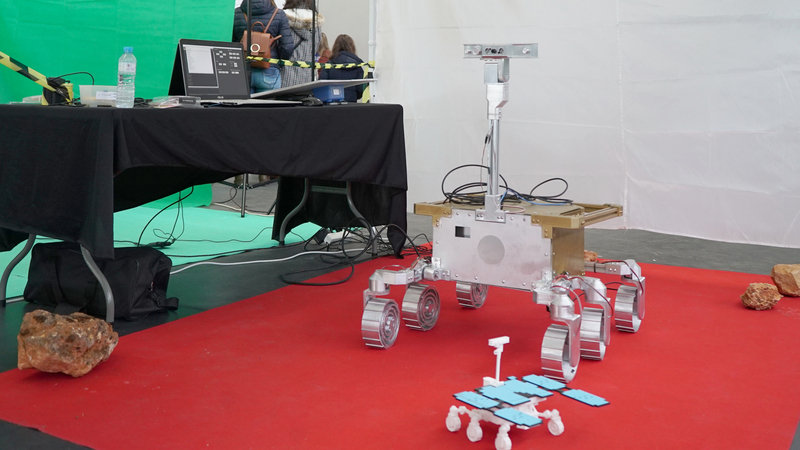 We update our functional robotic scaled model of ESA’s ExoMars’ Rosalind Franklin rover. ExoMars 2020 will deliver a rover and a surface platform to our neighbour planet. Like in the previous ExoMars mission, a Russian Proton rocket, formally known as UR-500, has been selected to launch the mission on a, for now, undetermined date in 2020. If conducted without incidents, the launching will lead to a nine-month interplanetary journey towards Mars. During this phase, a carrier module will transport the surface platform and the rover within a single aeroshell. Once in Mars, the descent module will separate from the carrier, and a parachute deployment sequence followed by a shorter propulsive braking phase will land the mission on either Mawrth Vallis or Oxia Planum, the final two candidates for the ExoMars 2020 mission landing site. During the descent phase, a heat shield will protect the payload from the severe heat flux and damping systems will soft the final contact. After landing, the rover will egress from the platform and both will start their missions. Exomars 2020 is the second and final mission of the ExoMars programme, the first one being ExoMars 2016. The ExoMars 2016 spacecraft consisted of the Trace Gas Orbiter (TGO) and the Schiaparelli EDM (Entry, Descent and Landing Demonstrator Module). TGO’s key goal was to gain a better understanding of methane and other atmospheric gases that could be evidence for possible biological or geological activity. The satellite is still orbiting Mars fully operational and its high-gain antenna will be used to support communications between ExoMars 2020 and ground stations on Earth. Schiaparelli was meant to test ESA’s entry, descent, and landing capabilities. Unfortunately, the landing went wrong in the final phase and Schiaparelli crashed into the surface, but the telemetry of the descent was successfully sent and it has helped to improve future landing systems such as the one being used in ExoMars 2020. ExoMars 2016 was led by the European Space Agency (ESA) in cooperation with Roscosmos, the Russian space agency, which provided the launch vehicle. 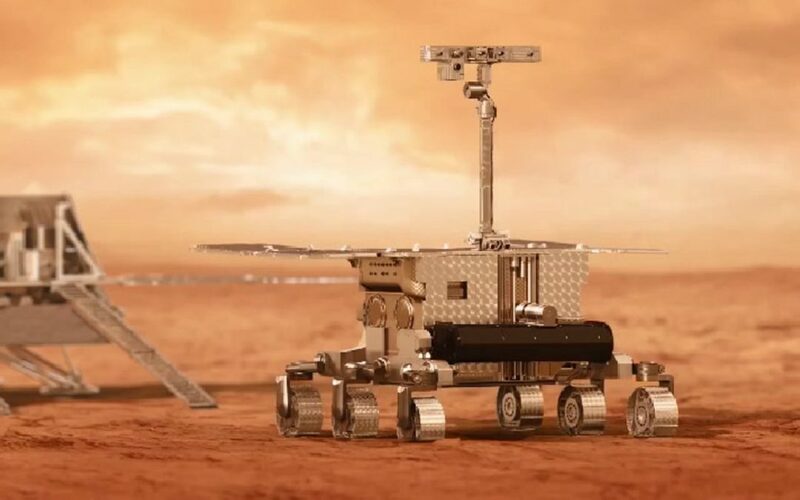 On the other hand, the ExoMars 2020 spacecraft will consist of a Rover and a landing platform. In this second endeavour, Roscosmos has taken a step forward as besides providing the launching vehicle they are fully in charge of the landing platform’s and the descent module’s design and of their consequent construction. Rosalind Franklin is ExoMars 2020’s rover, named after the homonymous English chemist and X-ray crystallographer that made contributions to the understanding of the molecular structure of DNA. The rover will travel several kilometres across the Martian surface to search for signs of life. The possible landing sites have been selected with this mission in mind, and they are thought to have the potential for finding well-preserved organic material in them, particularly from the very early history of the planet. The rover will collect some of this material with a drill, which is designed to extract samples from various depths, down to a maximum of two meters. This is important because due to the little protection that the tenuous Martian atmosphere offers from radiation and photochemistry, the possible organical remainings will have been better preserved under the surface, thus, underground samples are more likely to include biomarkers. The rover is essentially a laboratory on wheels: once collected, a sample is delivered to the rover’s analytical laboratory, here, they are analyzed in-situ with next-generation instruments that should determine the soil composition and identificate the presence of different substances such as minerals, organic substances, and biomarkers. Rosalind Franklin relies on a science payload of nine instruments conceived either for the targeting or analysis of samples: PanCam (The Panoramic Camera), that will perform digital terrain mapping of Mars and look for possible sample’s location. WISDOM (Water Ice and Subsurface Deposit Observation On Mars), a ground-penetrating radar to characterize the stratigraphy under the rover and decide where to collect subsurface samples for analysis. Adron, to search for subsurface water and hydrated minerals under the subsurface beneath the rover and therefore select suitable areas for drilling and sample collection. ISEM (Infrared Spectrometer for ExoMars), which will assess the mineralogical composition of surface targets and select suitable samples for further analysis by the other instruments. CLUPI (CLoseUP Imager) will acquire high-resolution colour close-up images of rocks, outcrops, drill fines and drill core samples. Ma_MISS (Mars Multispectral Imager for Subsurface Studies) will contribute to the study of the Martian mineralogy and rock formation. MicrOmega, a visible and infrared imaging spectrometer for mineralogy studies on Martian samples. MOMA (Mars Organic Molecule Analyser), that will target biomarkers to answer questions related to the potential origin, evolution, and distribution of life on Mars. And RLS (Raman Laser Spectrometer), whose database we designed, which will establish the mineralogical composition of the samples and identify organic pigments. Along the past few months, we have been working on a fully functional robotic scaled model of the Rosalind Franklin rover that is now available for demonstrations and educational projects. The main structure of the robot has been designed from scratch by our 3D team using CAD (Computer-Aided Design) programs and built out of standard anodized aluminium profiles and custom-design 3D-printed pieces. Inside, the rover hosts built-in cameras, a power source, individual motors for each wheels’ movement, and servos for the wheels’ and camera’s orientation. The control sub-systems for these electronics are Arduino-based and the main control software and its visual interface have been entirely developed by Space-Robotics. The software supports both individual movement commands and pre-programmed series of them. 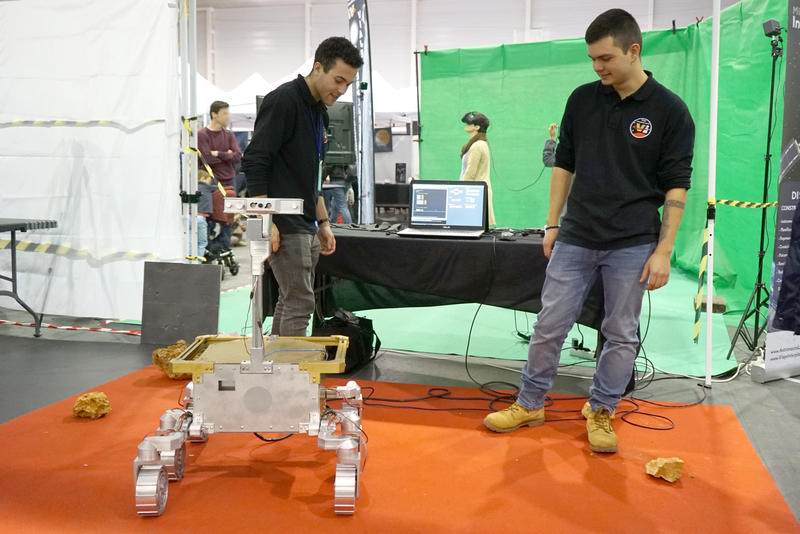 The result of this project is a scaled model of ExoMars’ rover that follows our instructions and has the ability to move in any direction and autonomously overcome big obstacles. As each piece of the robot’s main structure is custom-made, after examining the results of reliability tests we can easily build improved versions of these pieces and update them. This process is repeated frequently to improve the rover’s design and usually doesn’t take long. Right now, almost none of the original pieces remains as a part of the robot; and the result of all these changes is a tougher and more reliable vehicle. However, the tests sometimes suggest that electronic components ought to be changed, which requires more time and major efforts. One of these “major updates” that was recently performed has been the replacement of all the motors that made the wheels rotate. We had originally used step motors which offer greater control, but soon realized they were not powerful enough to move the vehicle smoothly. During the last few weeks, we have replaced them all with DC motors, that have proven to be just what we were looking for. We are currently working on some updates to the servos that orientate the wheels, but we’re still not sure if we are to replace them or if we can solve the issues 3D-printing some reinforcements. 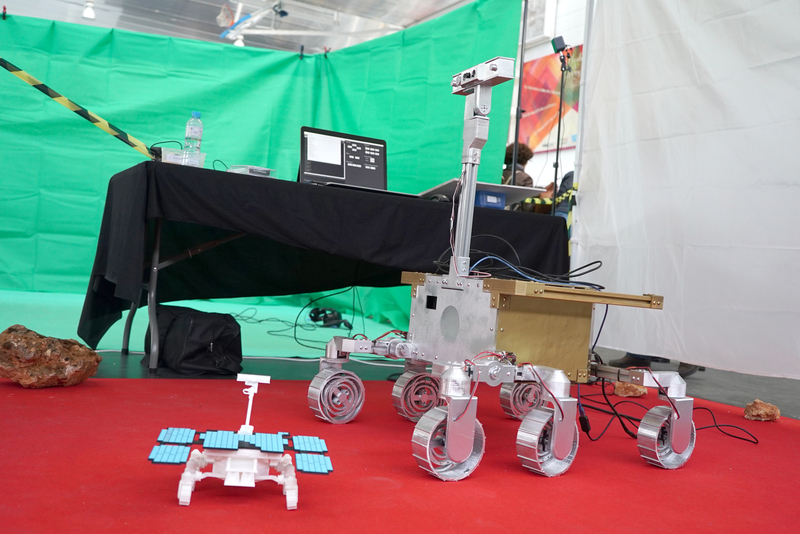 Keep in touch to find out more about future major updates to SpaceRobotics’ Rosalind Franklin Rover.